I keep a list of topics that I would like to write blogs about. They are usually things that I talk to my clients or class participants about in my practice about all the time, but it’s so much easier for me to explain things using my body or in conversation. So, unless I feel like making a bunch of videos (the idea horrifies me! ), I have to sit down and take the time to organize my thoughts into these blog posts. This particular topic has been a personal grind for me for the past decade. 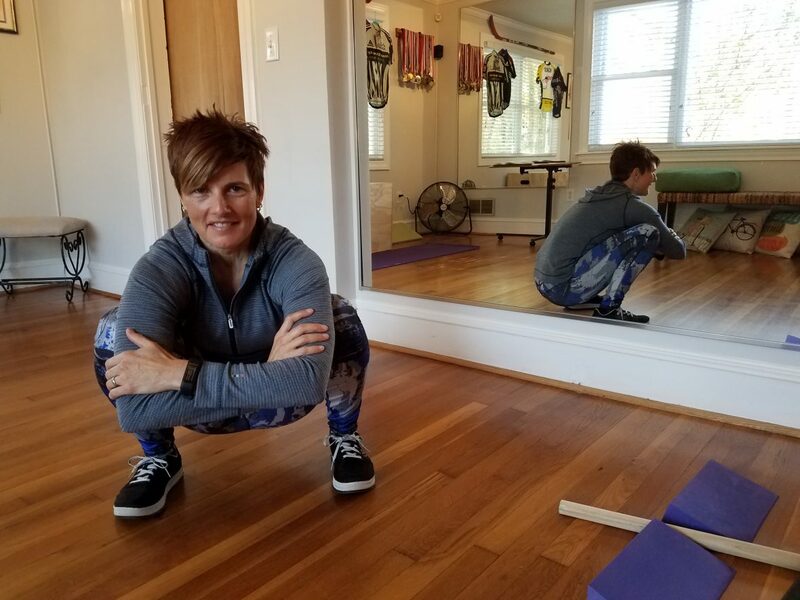 I was just passionately explaining to my family on a recent (and rare) family vacation how we don’t know how to sit in a deep squat anymore, and yet we are perfectly designed to do so. 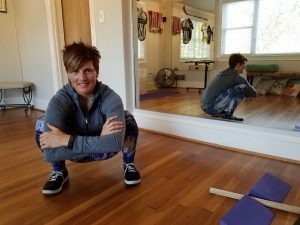 Our backs and hips love it, our innards (particularly our lower digestive systems) love it (enter the Squatty Potty), but we have physically trained ourselves out of doing it because we sit in chairs so much. 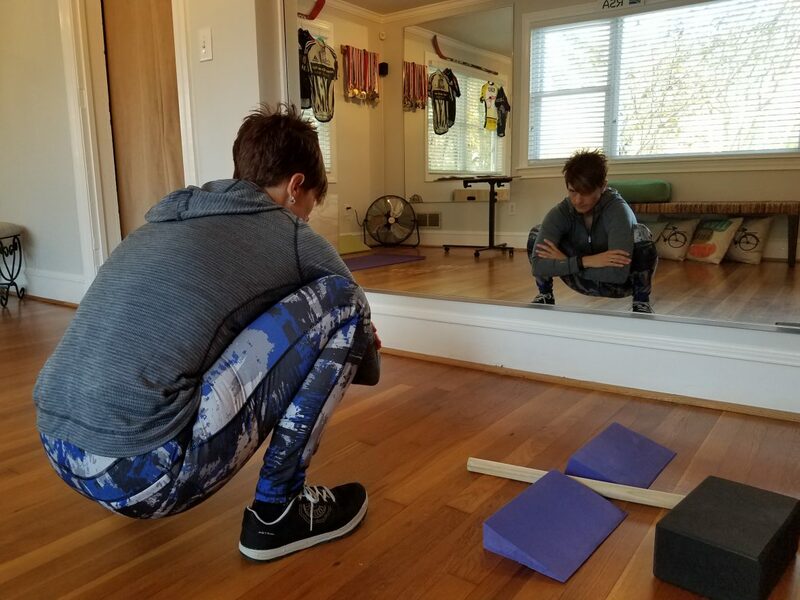 I make a point of getting down into a deep squat and sit there for a couple of minutes every day. I love to watch young kids move. 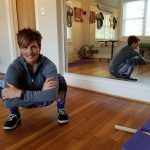 They sit in deep squat positions all the time, and get up effortlessly, move about, and get back down into that position. Around the time we start putting them in chairs for longer periods of time, they stop doing that. 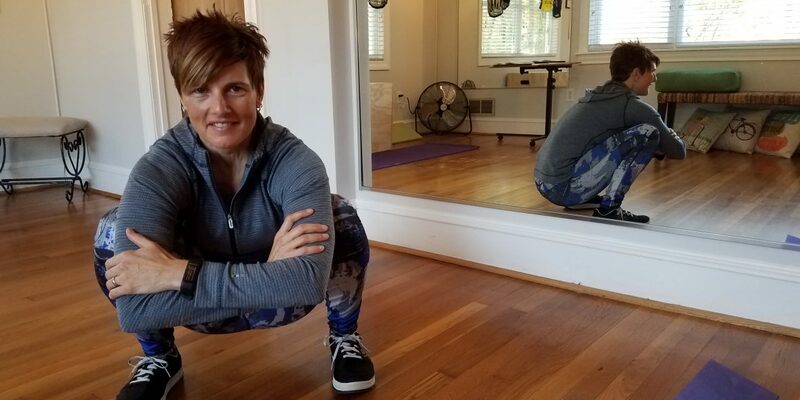 Yoga reintroduces some deep squat moves, but it’s not enough to do that once a week. We develop negative patterns that can’t be undone in one hour a week. What I do want to do in this blog, is to address the inefficiencies we’ve now created, and to teach you how you can get better at doing this every day. 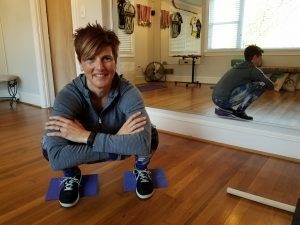 If you haven’t done a deep sitting squat in a while, and you attempt one, you may notice a few things. Firstly, some areas are going to be really tight. These could be your hips, your knees, or your calves/Achilles, among other things. You may find this is going to take some work over several weeks to get into this position, or you may find that you have permanent limitations that will never quite allow you to get there. 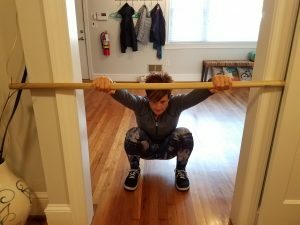 What this blog intends to do is to help you figure out a progression that will get you to a point where you are comfortable going as far as your body will allow. We’re going to start off with an ideal position and then work our way into the not-so-ideal ones, and the possible solutions to help you get into a more deeply squat position. 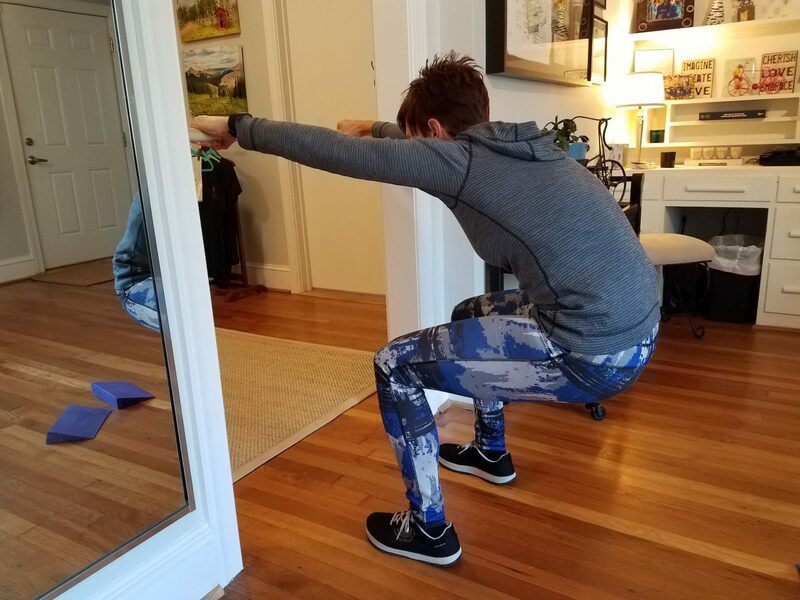 This is the ideal squat position (or the “Western” version thereof, anyway). I am comfortable sitting in this position. 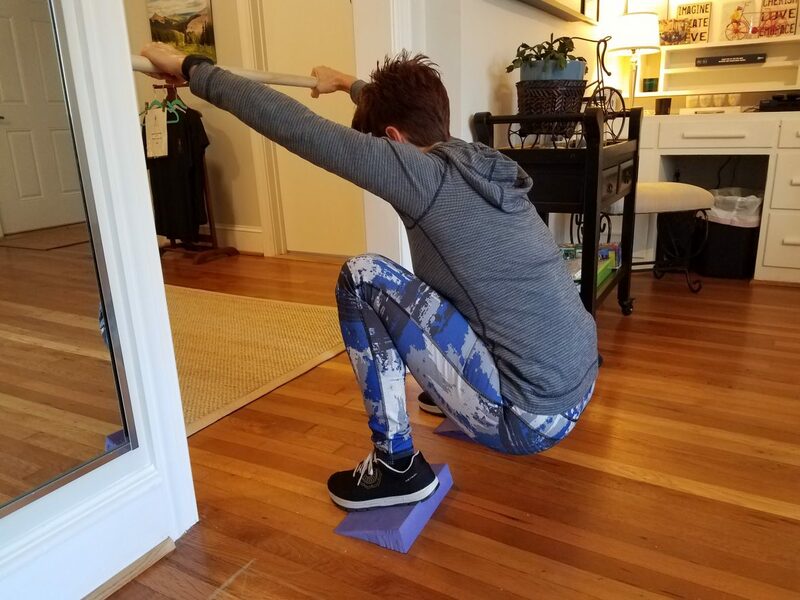 If you can get into this position, but your heels want to come up off the floor (calf muscles or Achilles are tight), then put wedges under your heels. I would encourage you to stretch your lower legs by standing on a slant board though. Tight gastrocs/soleii/Achilles can lead to other issues like Plantar Fasciitis. So, here we’ve given the lower legs a little “cheat” room, but we’re still getting the pelvis in the right position. If you find that your knees can’t flex that deeply, or your hips won’t accommodate that deep flexion, you can use a broomstick or a thick dowel in a doorway and perform the following moves. Supported squat with good knee flexion, but poor flexibility in lower legs. Slide the dowel down the other side of the doorway until you are nicely stretched out. (You might find some other limitations here, like shoulder flexibility). Supported squat with poor knee flexibility. As you can see with this one, it’s not ideal. It’s almost the same position as sitting in a chair. The difference though, is that using the broomstick or dowel, you can traction the back and begin to lower yourself down further as you feel comfortable. By expanding through the ribs as you breathe, you can get a good stretch through the thoracic region too.